Batman’s origin story exists in something of an odd place within the grand comic book canon. It’s a tale we all know the general details and various specifics of. But writers seldom spend time on the timeframe of Bruce Wayne’s life as a young, newly orphaned kid. While we know that witnessing his parents’ murder was the event that drove him to eventually become Batman, there is much about Bruce Wayne’s childhood that we’ve never really known about. He was a lonely child with a fear of bats, that much is certain. But—aside from a few scattered sequences over the decades—Bruce’s interiority and how he first dealt with his trauma as a kid remains a mystery. 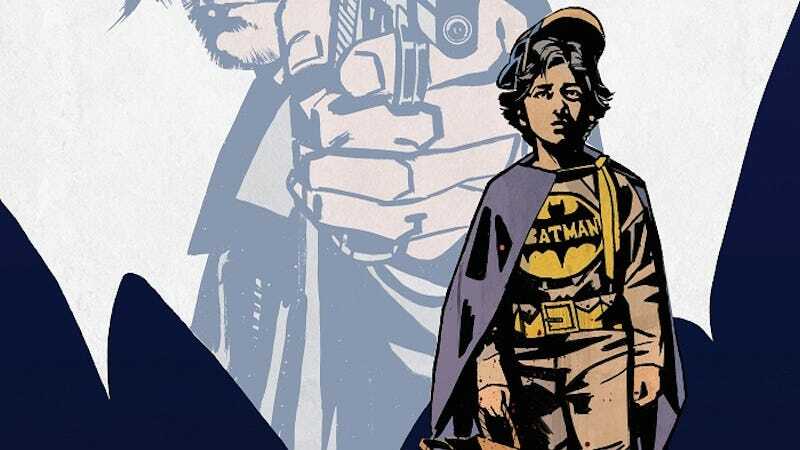 Kurt Busiek and John Paul Leon’s upcoming Batman: Creature of the Dark isn’t exactly setting out to finally explore what Bruce Wayne’s days as a child were like. Rather, it tells the story of Bruce Wainwright, another orphaned boy growing up in Boston who happens to love Batman. After the Wainwright parents are murdered during a robbery, Bruce loses himself in the comics he loves as an escape from the horrors of his own life. According to DC, Creature of the Night can be looked at as a companion book to Busiek and Stuart Immomen’s Superman: Secret Identity from 2004, a story about a regular boy named Clark Kent from a world in which superheroes aren’t real who, one day, begins to develop powers similar to Superman’s. If Creature of the Night’s anything like Secret Identity, then we’re all in for something very good. Batman: Creature of the Night hits stores later this November.